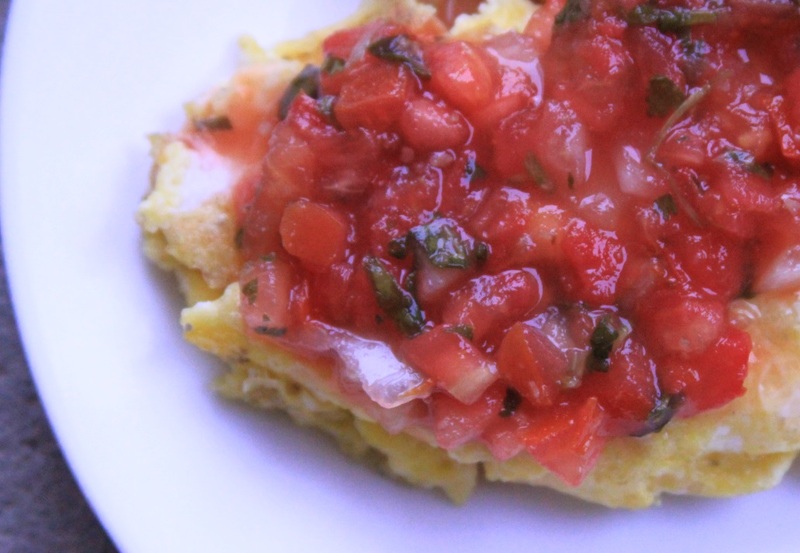 Scrambled eggs with cilantro salsa. It’s breakfast. I guess. So I was suuuuuper excited about my as-yet-made egg salad from the hard-boiled eggs I made last night. Well, not so much, my friends. Not. so. much. I opened up the fridge only to discover all of my hardened chicken ova had been swiped by family members (like Ninjas!) with apparent deviled egg fetishes. Oh the albuminanity! I’m not complaining; I’m happy everyone saw them as an easy, delicious lunch. And it’s not that I need to eat even MORE eggs. From my daily breakfast menu (see image above; it feels like I eat that many eggs per forkful), it’s pretty apparent that I’m eating plenty of those little chicken repositories of nourishment every day. In fact, I’m at the point where it’s not even about liking eggs; it’s about eating for fuel and maintaining the Atkins 1972 rules of induction. Sure, I prefer my fuel in the form of Cheetos, but that orange-tinged shame of my many-snack-orgied past hangs over my head like the roll of fat over my pants. Alas, poor eggs. Alas. No eggs, that’s for sure. I did the hell out of this: Thanks to FitBit, I know I took 2,613 steps and walked 1.11 miles without putting much effort into it. Yeah, I’ll work on that. I thought about this: Fat percentages. Yesterday the low-low carb was a kick to my ample backside. With no cheese and obviously less calories than I’d had in a while, I’m adding some dietary fat today to get closer to my 75% levels of calories from fat. This will boost the calories a little bit and I’ll feel less like motor boating a bowl of full-fat whipping cream (awkward). How do you sneak in extra fat? I’ll say this, though. I actually went to buy some rotisserie chicken! Only two drumsticks, but I ate those suckers clean. It was like eating chocolate cake. I saw you put butter in your coffee. I also add coconut oil and heavy whipping cream to mine and it is delicious. Thank you! That sounds pretty terrific! I will try that, too! I get the extra fat in partly with bullet-proof green tea. Long story on this one: green tea helps shrink fibroids. So I switched away from coffee (mostly) to green tea. I put in Kerrygold butter, as the most grassfed butter easily available to me (without having to drive an hour or so to a farm or spending truly ridiculous amounts of money–Aldi has it on sale this week! ), and then I put in some coconut oil. My kids think I’m nuts but it’s really not too bad. Not nearly as good as Boca Java Surfin’ Safari coffee with the same additions, but not bad at all. If I put in too much coconut oil then I don’t like it, and I do like coconut a lot. Just not warmish tea-flavored coconut. Urrrgh. That does sound really nice with the green tea! I’ll have to try that! The butter is just so smooth and adds just enough sweet to the coffee. It’s better than cream…but then I remember, “Hey. Butter IS cream.” No wonder. No wonder. Any suggestions on green tea brands? I like Tazo Green tea the best. The only time I successfully liked it was at Starbucks. We have a different name brand at home, but it’s pretty bitter. Like the tears of a forlorn girl whose best friend stole her boyfriend.